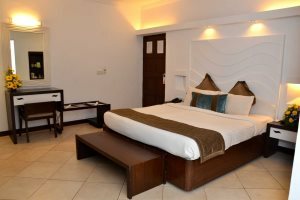 Providing a quiet haven in the lively town of Candolim, Sonesta Inns is an oasis of calm and the ideal choice for a relaxing holiday. The hotel’s peaceful location – relax, unwind and soak up the sunshine here, listening to the gentle sound of palms swaying in the breeze and the soft chirps of the exotic birdlife. The ample restaurants and shops nearby in the centre of Candolim village. The rooms are all unique in size, shape and view. 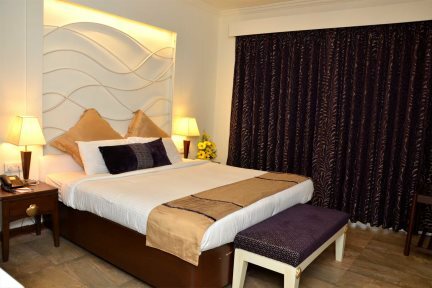 Set in a residential area, just a short stroll from the beach and only moments from the hustle and bustle of this popular tourist resort, Sonesta Inns is an oasis of calm and the ideal choice for a relaxing holiday. The mature gardens are filled with colourful flowers, lush lawns and coconut palms that surround a large and inviting swimming pool. Relax, unwind and soak up the sunshine here, listening to the gentle sound of palms swaying in the breeze and the soft chirps of the exotic birdlife - guests will be forgiven for wanting to spend much of their holiday in this peaceful retreat. When it comes to rooms, each is unique in size, shape and view, decorated in natural tones and presented in a bright and airy manner. The hotel’s restaurant is also a real bonus, offering an excellent range of delicious local delicacies as well as international cuisine. A short stroll through Sonesta’s gardens will lead you to the golden sands of Candolim Beach, the longest stretch of beach in North Goa. Backed by colourful beach shacks serving the catch of the day and ice-cold Kingfisher beers, you’ll find it hard to tear yourself away. "I had such a relaxing stay at Sonesta Inns. It is just a short stroll down the path to the beach and a stone’s throw from the bustling resort centre of Candolim." The Standard rooms are unique, and have either a balcony or terrace with views over the pool area or Candolim village. They are comfortably furnished and include double or twin beds and a shower room. The Suites are larger in size with a separate lounge area. They are comfortably furnished and include double or twin beds and a bathroom.